Includes the names: Naomi Nye, Naomi S Nye, Naomi Shahib Nye, Naomi Shihab Nye, Naomi Shihab Nye, Naomi Shilhab Nye, selected by Naomi Shihab Nye. Chapter & Verse is a national book club for children’s literature enthusiasts who wish to discuss children’s and young adult fiction, nonfiction, picture books, and poetry. They meet the third Thursday of every month at Red Balloon and are sponsored by Winding Oak. The Poetry Reading Group will meet at Around the Corner Cafe on October 19 at 3 pm to discuss You and Yours by Naomi Shihab Nye. For more information about the group or to join please contact Carol at cgraser@northshire.com. 7 pm | FRIDAY, SEPTEMBER 19 Naomi Shihab Nye Reading and Q&A Yavapai College Southwest Literary Series Please Note: This is an offsite event at the Yavapai College Library, Susan N. Webb Community Room, Building 19, Room 147. Visit Yavapai College for more information. Naomi Shihab Nye was born on March 12, 1952, in St. Louis, Missouri, to a Palestinian father and an American mother. During her high school years, she lived in Ramallah in Palestine, the Old City in Jerusalem, and San Antonio, Texas, where she later received her BA in English and world religions from Trinity University. Nye is the author of numerous books of poems, including Transfer (BOA Editions, 2011); You and Yours (BOA Editions, 2005), which received the Isabella Gardner Poetry Award; 19 Varieties of Gazelle: Poems of the Middle East (Greenwillow Books, 2002), a collection of new and selected poems about the Middle East; Fuel (BOA Editions, 1998); Red Suitcase (BOA Editions, 1994); and Hugging the Jukebox (Far Corner Books, 1982). She is also the author of several books of poetry and fiction for children, including Habibi (Simon Pulse, 1997), for which she received the Jane Addams Children’s Book award in 1998. Nye’s honors include awards from the International Poetry Forum and the Texas Institute of Letters, the Carity Randall Prize, and four Pushcart Prizes. She has been a Lannan Fellow, a Guggenheim Fellow, and a Witter Bynner Fellow. In 1988, she received The Academy of American Poets’ Lavan Award, selected by W. S. Merwin. ABOUT THE TURTLE OMAN This accessible, exquisite novel shines with gentle humor and explores themes of moving, family, nature, and immigration. It tells the story of Aref Al-Amri, who must say good-bye to everything and everyone he loves in his hometown of Muscat, Oman, as his family prepares to move to Ann Arbor, Michigan. ABOUT 19 Varieties of Gazelle: Poems of the Middle East "Tell me how to live so many lives at once ..."
Maybe they have something to tell us. Naomi Shihab Nye has been writing about being Arab-American, about Jerusalem, about the West Bank, about family all her life. These new and collected poems of the Middle East — sixty in all — appear together here for the first time. Publisher Marketing: This accessible, exquisite novel shines with gentle humor and explores themes of moving, family, nature, and immigration. It tells the story of Aref Al-Amri, who must say good-bye to everything and everyone he loves in his hometown of Muscat, Oman, as his family prepares to move to Ann Arbor, Michigan. This is acclaimed poet and National Book Award Finalist Naomi Shihab Nye's first novel set in the Middle East since her acclaimed Habibi. Aref Al-Amri does not want to leave Oman. He does not want to leave his elementary school, his friends, or his beloved grandfather, Siddi. He does not want to live in Ann Arbor, Michigan, where his parents will go to graduate school. His mother is desperate for him to pack his suitcase, but he refuses. Finally, she calls Siddi for help. But rather than pack, Aref and Siddi go on a series of adventures. They visit the camp of a thousand stars deep in the desert, they sleep on Siddi's roof, they fish in the Gulf of Oman and dream about going to India, and they travel to the nature reserve to watch the sea turtles. At each stop, Siddi finds a small stone that he later slips into Aref's suitcase--mementos of home. Naomi Shihab Nye's warmth, attention to detail, and belief in the power of empathy and connection shines from every page. Features black-and-white spot art and decorations by Betsy Peterschmidt. Review Citations: · Kirkus Reviews 06/01/2014 (EAN 9780062019721, Hardcover) - *Starred Review · School Library Journal 06/01/2014 pg. 107 (EAN 9780062019721, Hardcover) · Publishers Weekly 06/02/2014 (EAN 9780062019721, Hardcover) Contributor Bio: Nye, Naomi Shihab Naomi Shihab Nye is a poet and anthologist and the acclaimed author of Habibi: A Novel and Sitti's Secrets, a picture book, which was based on her own experiences visiting her beloved Sitti in Palestine. Her book 19 Varieties of Gazelle: Poems of the Middle East was a finalist for the National Book Award. She has taught writing and worked in schools all over the world, including in Muscat, Oman. She lives in San Antonio, Texas. 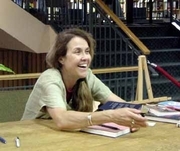 Naomi Shihab Nye is currently considered a "single author." If one or more works are by a distinct, homonymous authors, go ahead and split the author. Naomi Shihab Nye is composed of 8 names. You can examine and separate out names.